Nestled next to Rickreall Creek with every amenity you expect in a fine resort. Walk the nature trail, play pickle ball, basketball, ping pong. Big swimming pool & hot tub. On site movie theater. Hospitality second to none!! Three yurts with decks - fully furnished, linens provided, mini refrigerators, coffee makers, microwaves, TVs and DVD players. Barbecues on decks. DVD's available to check out. My family and I booked a week at this campground at one of their beautiful tent camping sites and had such a good experience we extended our stay to just over two weeks. We couldn't have been happier. The campground is stunning -- the RV sites are nice, many with their own patios and privacy shrubs the tent sites are magical -- secluded into a little nook of the surrounding forest where you can hear the river below and pick blackberries right on your site. There's even a hiking trail right on the property that takes you back into the woods and by the river! We loved it. The staff was really nice too. Several times they asked if we were staying warm enough and one employee even offered us a space heater if we needed it. The bathrooms seemed to get cleaned at least twice a day more often than not I'd find the shower freshly cleaned. The showers had large changing areas and the water temperature was consistent and hot (if you stay in a lot of campgrounds you know this is not always the case!). The tents have access to a nearby private bathroom & shower in the workout room/game room. That was nice to have close by, although I preferred the larger bathrooms farther away because they were cleaner. Oh! And I almost forgot - the tent sites have access to a small hut with a microwave and two sinks that's open 24 hours. I know it's not exactly traditional to microwave a burrito for dinner while tent camping, but if you're on a longer trip sometimes it's nice not to have to drag out the camp stove and make a meal and clean up. Finally, when we booked our site originally we were on the fence because they didn't have electricity right at the site. We're traveling with our toddler who won't sleep under covers, so we need to run a heater at night since it's October and the temps got into the high 30s & low 40s at night. The staff said we could run a 100' extension cord to the building with the microwave where there's an outlet, so we used that with no problems at all. 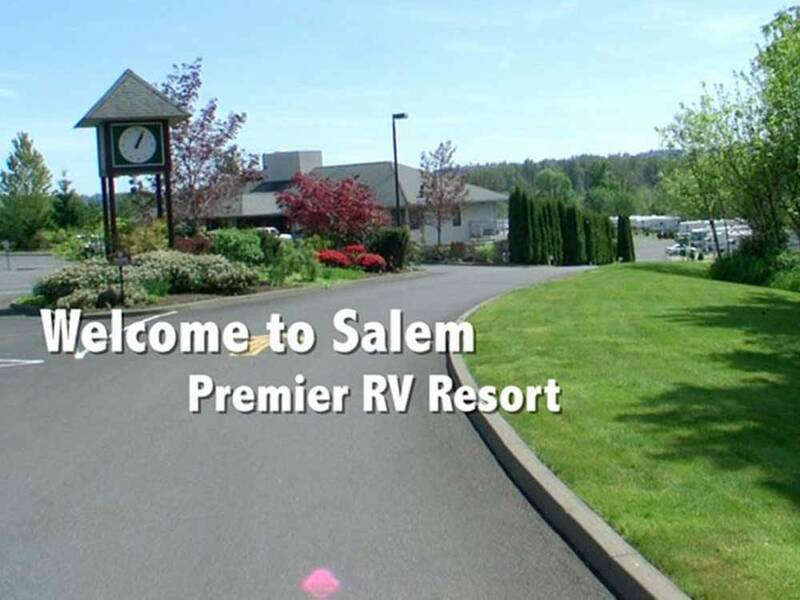 We later stayed at a different campground where the same request was not met with such kindness or understanding, so in hindsight we appreciate their accommodating our needs at Premier in Salem even more. We would totally stay here again and highly recommend it. In our experience it was very kid- and family-friendly. Oh, and we had our dog (Pomeranian) with us as well and felt the camp was very pet-friendly, too. Some sites are not long enough so vehicles are parked in the street which make the park difficult to navigate in a big rig. The park was beautiful and quiet. They even had a dog wash - free. We had to take advantage of it since this was the first park we have seen with an actual dog wash.
Bathrooms were open bay with 4 sinks, 4 toilets, 2 urinal, 6 showers. Pull in wide sites with concrete pads. Water, elect, and sewer connections were very good. Great reception area, laundry room, day room was in great shape. Pool was in great condition. Staff was courteous, friendly, and knowledgeable. Park was in excellent shape. It is within driving distance to stores and restaurants. Our Yurts have Attitude! And Comfort! Sofas, TV's, Beds and Linens for up to 4. 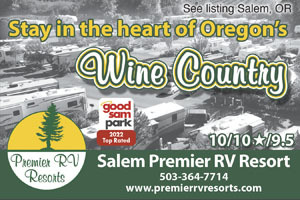 Leave your RV & worries at home. Watch the stars thru the skylight, barbecue on your deck (our grill), relax in our pool & spa. Play pickle ball.